My second Urban Sketchers 10x10 workshop was Sue Heston’s “Simple Shapes Stronger Sketches.” Many sketchers, myself included, immediately become ensnarled by the mass of details in any view we might start to draw. Sue’s workshop directly addresses this issue by keeping students focused only on large shapes. 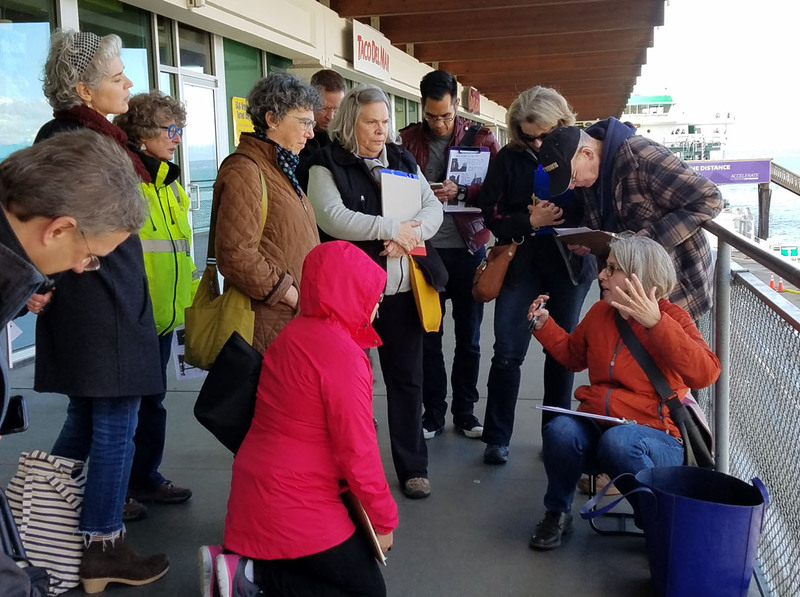 On a chilly but dry Saturday morning, 14 sketchers gathered at the downtown ferry terminal to start seeing those shapes. In most outdoor urban views, the largest shape is the sky. 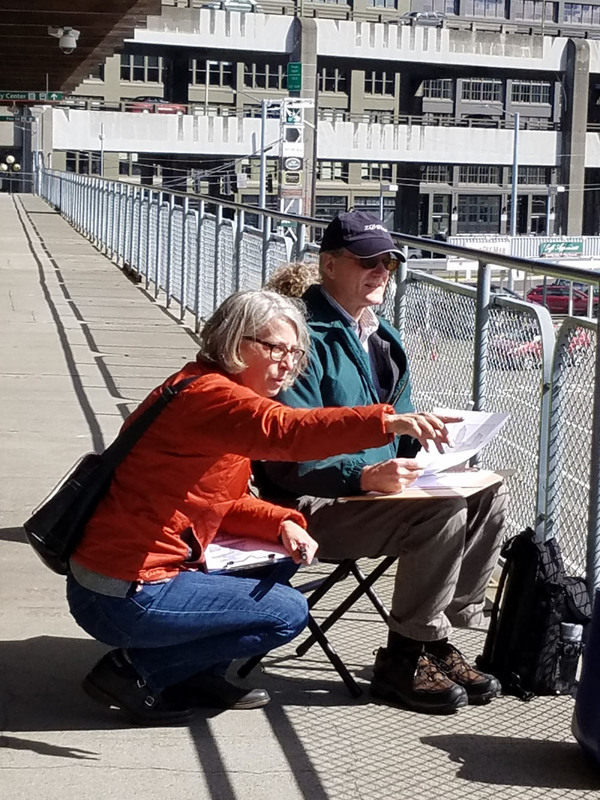 “Unlike many things – cars, trees, people – we don’t have preconceived ideas about the shape of the sky,” Sue says in her handout, which makes it an easier shape to see accurately and objectively. With that in mind, our first exercise was to choose a composition and use a wide, light-colored marker to draw the sky as a single shape. (Fat markers were recommended because it’s impossible to get fussy with details when you have those in your hand!) The next step was to fill in the “not-sky” shape with a medium gray marker, forming another large shape. We did as many of these as possible to get away from trying to draw individual buildings, windows and rooftops and instead focused on the abstracted shapes. 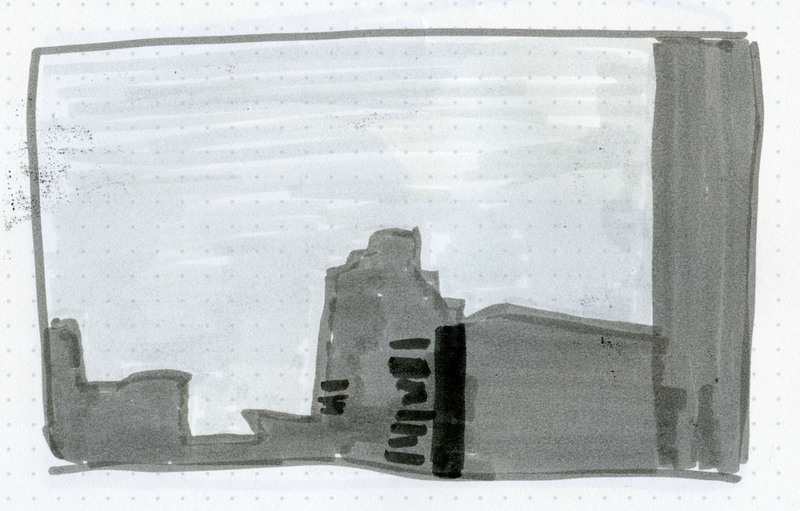 Sue warned us not to try to make nice sketches in these exercises; they were meant to be more like thumbnails that help us see values and compositions. The second exercise built on the first by bringing in a dark gray or black marker for the shadow shapes. Starting new compositions or simply adding to the sketches we made in the first exercise, we looked for the darkest areas to fill in. 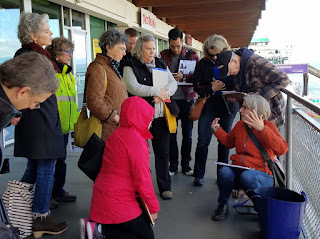 For the final exercise, Sue encouraged us to use our medium of choice while still following the same principles we’d practiced all morning: Make the sky shape; make the not-sky shape; finish with shadow shapes and finally details. Although I don’t usually favor fat markers, I was certain that if I picked up my usual pens or colored pencils I’d fall back into my old habits. I decided to keep going and make a few more sketches with markers to reinforce what I’d learned. 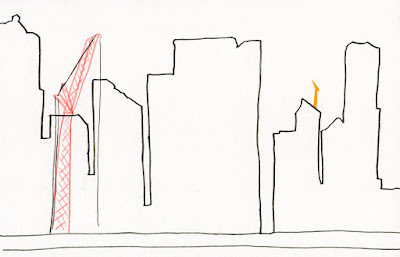 After drawing the sky shape for one skyline, my intention was to color in the gray and black, but I liked the simple line so much that I left it unshaded. 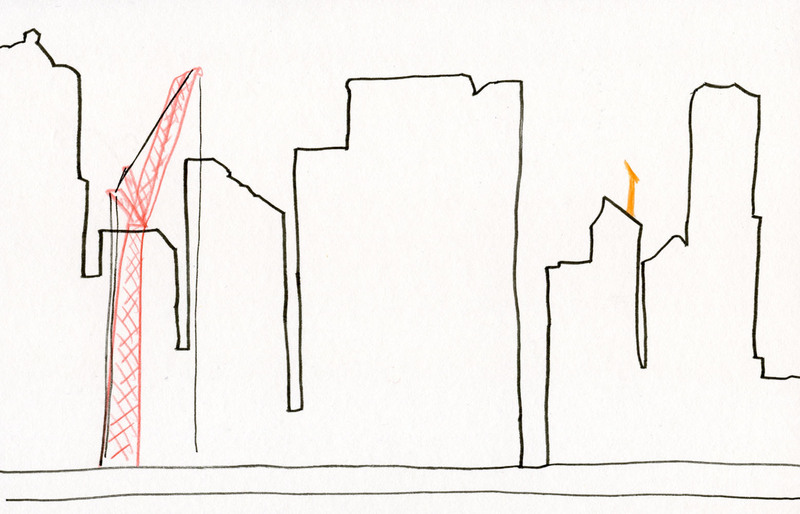 Of course, I couldn’t resist adding a couple of cranes. 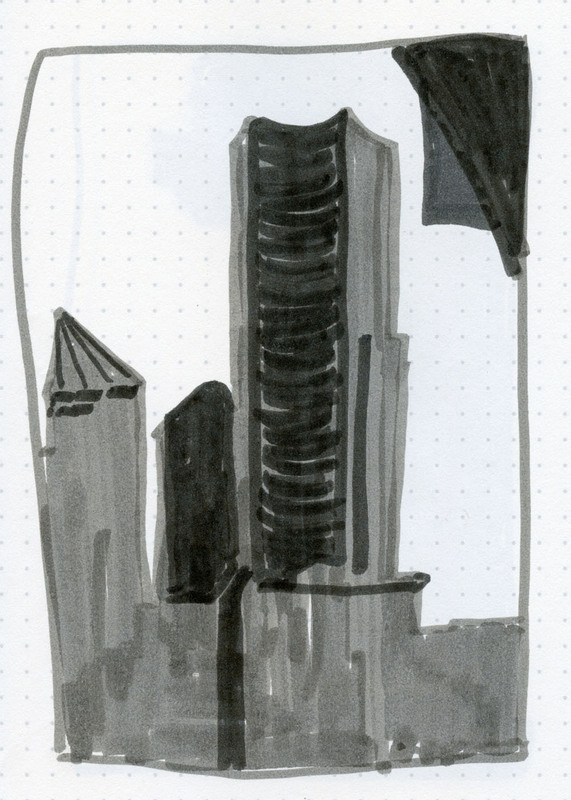 My favorite sketch of the day was of my beloved Smith Tower framed by the interesting sky shape formed by the terminal building’s overhang. As humans who innately look for shapes we recognize, we don’t naturally “see” the shapes in between or around those recognizable things. We have to train our eyes to see those abstract shapes. Remember those “magic eyes” picture books of the ‘90s? If you crossed your eyes just right, a three-dimensional pictured popped out of the larger picture. I remember it took me a while to see the first one, but once I did, the rest snapped into place almost immediately. 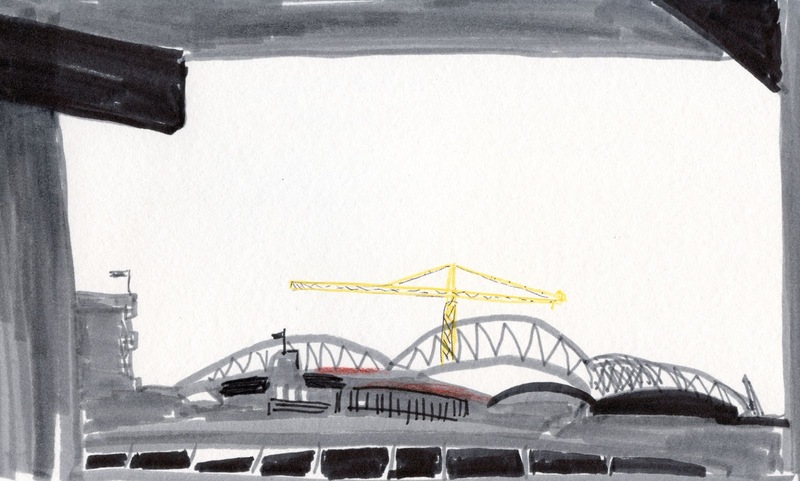 By the end of the workshop, I started feeling that way about the sky shapes surrounding the buildings, cranes, rooftops, stadiums and millions of other details in front of me. I think those larger shapes will snap into place easily for me now, helping me make better sketches with any medium. Sue points out a sky shape. I love your reports of your classes. Thanks for sharing! 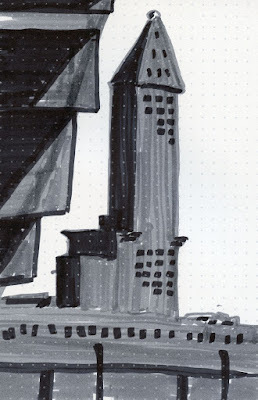 The sketch of the Smith tower caught my eyes! Thanks for the detailed report. You're welcome! Glad you found the review useful. Sue gave a great workshop! I thought Sue's workshop was terrific and gave me the opportunity to "see" shapes in a different way. Excellent teacher and not a wasted moment. I'd recommend the class to anyone. Thanks Tina for being the TA and providing this excellent review. Good to see you, Frank! And I'm glad you enjoyed the workshop as much as I did. This was truly a major thought process change for me. And it took me awhile to stay focused on the large negative shapes. I kept wanting to add detail, but I held out and it made a difference in the finished painting. I found that it really helped to do it this way because the details just fell into place at the end. Thanks, Sue for a really good class! This workshop really changed the way I see and think, too!